The Moss gym is a single story, rectangular (88′ x 69′) structure constructed of untooled and uncoursed native sandstone. The masonry is very crude. The composition shingle covered roof is gabled; the recessed entry is covered by a small porch. Small sash windows with cut stone sills are placed under the eaves. To either end of the building have been added concrete block lean-to structures, but neither impair the integrity of the building. 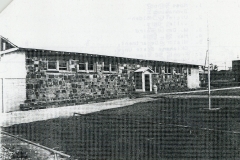 As a WPA school building, the structure is notable for its crude workmanship and very early construction date. It reflects that the program was just in its genesis. Within the community it is unique architecturally for its type and workmanship. Moreover, the building seems to have been a prototype for structures later built on the Moss school campus. The gym is significant because construction of it provided work opportunities for unskilled and unemployed laborers in the rural Moss area where none had previously existed and because it provided space for school and community activities, especially basketball, which fostered a sense of identity and pride not widely known in the region beforehand. VERBAL BO UN DARY DESCRIPTION: From the intersection of U.S highway No. 270 and No. 75 nine miles east of Holdenville, go one mile south and one mile east. Gym property begins at the NE corner of Sec. 22, T 7 N, R 10 E, and goes south 225 feet, west 120 feet, north 225 feet and east 120 feet.